You know him as the voice of Cinderella, but you have never heard him quite like this. 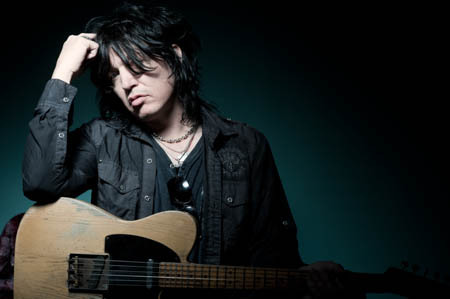 Tom Keifer released his first solo record this year and it’s been a long time coming. After selling 15 million albums world-wide, several MTV staples and countless radio hits, Keifer takes a breather from Cinderella for his solo debut The Way Life Goes. It’s arguably the multi-instrumentalist, singer-songwriter’s best work to date, and it is definitely a contender for rock album of the year. I have been a huge fan of Tom and Cinderella for many years now. In fact Cinderella’s debut, Night Songs was the first LP I ever purchased. That record sounds just as spectacular today as it did when it first came out, and I would easily put it in the top 10 metal records from the decade of decadence. I was fortunate enough to speak with Tom recently about his incredibly colorful career both past and present and some very interesting details surrounding the new record. Do you have a favorite touring moment past or present? Man, it’s hard to narrow it down to one. I mean there have certainly been some stand-outs along the way. Lately I have been talking a lot about the Moscow Music Peace Festival that happened years ago. Looking back now, it has more and more meaning. Things were pretty hectic and life was moving very fast for us. I am not sure we realized how cool that gig was when we were actually there. I see it popping up a lot more in You Tube and younger generations talking about it now. That was a very cool moment in our career—to be able to go into the Soviet Union at that time. It was 1988, and to see the impact of rock music and how our culture had seeped through an oppressive government. They didn’t allow our records and they wouldn’t allow jeans, but there we all were on stage at Lenin Stadium in front of a hundred thousand people wearing jeans and holding up rock records. That was a standout moment for sure. Over the years, where is the most unusual place that you have heard your music? I have never heard it in an elevator! Most unusual place, I don’t know…I don’t think I have ever heard it anywhere unusual, not that I can remember. I have heard it when it caught me off guard. I remember one time being in a clothing store or somewhere in the ’80s and I heard it, but I didn’t realize it was me. I remember hearing some blues guitar coming out of a boom box from behind a counter. I thought to myself, “that sounds kind of cool.” It was when I got closer that I realized it was the title track from Long Cold Winter. Those are usually the moments where one can actually appreciate their own music, because you don’t know it’s you. As soon as you know it is, you start remembering the things that you didn’t like about it or whatever. I think most musicians go through that after you spend a lot of time making a record. But that moment stands out in my mind because it was true, I was truly getting to hear my music objectively for a brief moment. When you were recording “Don’t Know What You Got Till Its Gone” did you guys have any idea the impact this song would have and how big of a hit it would become? No, not really. I mean, I like the song and I knew it was a good song, but you never really know if it’s going to have legs. That one certainly has and it’s been quite good to us over the years and I think to the listeners too. I think a lot of people can relate to that song and those lyrics. It’s still one of my favorite songs to play live, if not THE favorite. It’s also one of my favorite songs that I’ve ever written. At the time it was just another good song and I certainly felt it was good enough to have it on the record. Your first tour ever was with Loudness correct? You have a very good memory! It was our very first experience touring. We hadn’t really ventured far beyond Philadelphia and when the record came out we toured the West Coast, about three weeks supporting Loudness. The other support act was Poison and neither one of our records had broken yet. We were flip-flopping you know, we went on first or second, and Loudness was the headliner. That’s when we first met Poison. One of the most infamous Cinderella lyrics is “I need a shot of gasoline.” Can you tell me where that came from and what it means exactly? When I wrote it, it was a drink. All my lyrics are about life; good times, bad times, falling in love, falling out of love, triumph over tragedy, and life struggles. So “Night Songs” is a little bit of the frustration of life that I think what we all go through. The song is about working all day and wanting that release at night. We are going out and singing night songs which I guess is a metaphor for going to see a band or just letting your hair down. I mean, it means different things to different people. Coming out of verses it’s [Tom recites the lyrics word for word which is super cool to hear over the phone by the way] “working this job ain’t paying the bills, sick and tired rat race taking my thrills, kicking down the road not a dime in my pocket, nigh time falls and I’m ready to rock it” and then the next line is, “I need a shot of gasoline,” so now we are out at night I guess, letting off a little steam. That’s what it meant to me I think when I wrote it, it was a long time ago and I guess different people can take it different ways. How long has the solo record been in the works and what are the earliest recordings you have on there and the latest? The production of the record took ten years. We started actually cutting tracks and making the solo record here in 2003 and then worked on it off and on over the years. I was producing it for an independent label so there was no deadline or pressure of a release date. So, I really took my time with it and just enjoyed the process making it for the love of music. All the writing took place prior to that as I had a very creative period of time between the years of ’95 and about 2002 when I wrote constantly. It was right after Cinderella had split up in the mid 90’s and the whole music scene had changed. We lost our deal with Mercury Records and I was looking to do something different. I started writing with people in Nashville and eventually moved here. The idea was that I would do a solo record because the band was breaking up, but I kept putting it on the back burner, but kept on writing. Even though they were written prior to 2003, the majority of production work on those songs were done more like around 2007 or 2008. We cut the record literally two or three tracks at a time over the years, but I used the same musicians each time. I kept bringing them back because I like how they played, so it’s the same rhythm section throughout the record while I did the majority of the guitar. “Ask Me Yesterday” has a bit of a country feel to it as you know, maybe one or two of the other tracks on the record do as well, and funny enough Wikipedia has “country” as a genre listed under your name. I’m wondering, are you aware of that and how much of a country influence do you have being in Nashville? I love country music, but honestly it goes back to the Stones, Zeppelin, and The Eagles for me. Growing up in the ’70s, the Eagles had that country rock feel and I loved it. And Zeppelin had a lot of acoustic, boarderline Celtic songs along with some country stuff as well. But the Stones really did it for me with “Honky Tonk Woman,” “The Girl with Faraway Eyes,” and “Wild Horses.” All the bands that I grew up on really embraced and were inspired by American roots music from the blues to country to R&B to gospel. That’s just always been a part of what I have loved. Cinderella grew from album to album. We started introducing more and more of that sound. Even on the second record we had an acoustic delta blues intro to open up “Bad Seamstress Blues.” “Coming Home” had a country feel to it and we really began to grow our production and instrumentation. We took it even further on Heartbreak Station. So yeah, I think it’s a big part of what inspired me and more and more that’s become a part of my writing. Not just country obviously, but I mean blues and gospel elements on songs like “Shelter Me” and even on some of the new songs. I love that combination of hard rock and gospel vocals that goes back to like “Tumbling Dice” with the Stones. I always like that sound when you have a real spiritual background against a hard-driving track. Tom Keifer’s The Way Life Goes is on store shelves right now.